There is no doubt that SS15 is the spot where you would most probably find all the foodies at. If it is your first time trying out hipster cafés, then I reckon that SS15 is where you should be at. Also, if you’re overwhelmed with all the options, then Naj & Belle should be the first! Located on the ground floor of SS15 Courtyard, next to the main entrance of the mall, it is quite hard for you to miss it. The ambiance of the place, with its bright lights made it inviting. There was also sunlight streaming in through the large unobstructed windows and we got to bask in its natural lighting too. We noticed how Naj & Belle is able to accommodate different group sizes. Whether you’re a group of 4-5 friends or a bigger group of above 10, the restaurant is able to accommodate you. In fact, whilst we were there, a huge group of 10 were throwing a mini birthday bash. There’s plenty to choose from on their menu but since pasta is a go-to dish, we went with the Fettuccine Smoked Salmon (RM29). With Spanish onion, fresh basil, sundried tomato, Napoli sauce and a touch of cream, we were in pasta heaven. The dish was an exact replica of a classic bolognese, just minus the beef, and salmon was added instead. 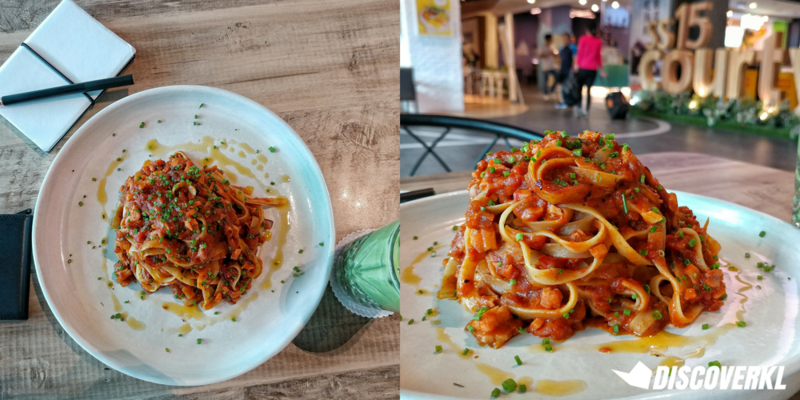 The salmon was a surprisingly good combination with this style of pasta – overall, it was good, especially since they were generous with the amount of salmon chunks in the dish. Quite satisfactory, even by a pasta lover’s standard. Hands down, this dish is my favourite. 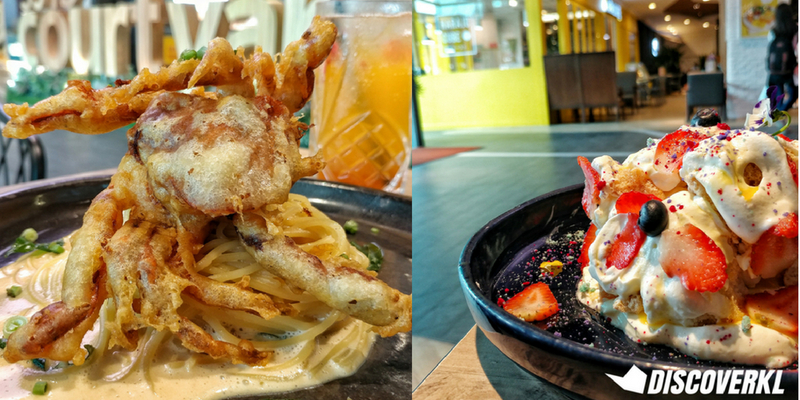 Naj & Belle’s Asian Style Carbonara With Soft Shell Crab Tempura (RM29) would literally be the reason why I would make a second visit. 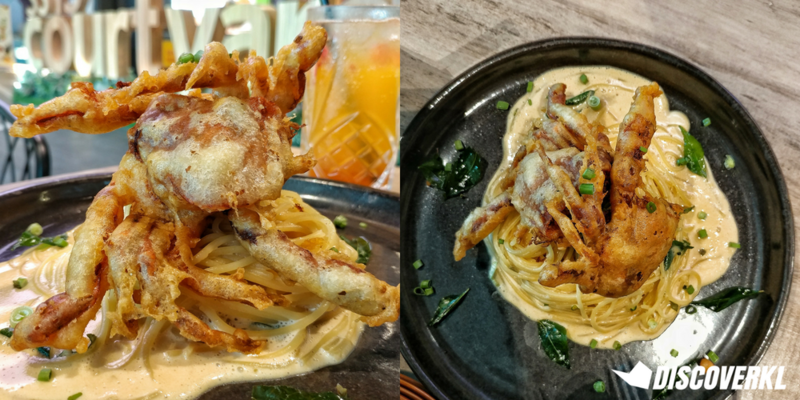 Where else would you actually get a generous portion of soft-shell crab with a good balance of sauce and pasta? The soft shell crab was cooked well and had that perfect crunch to it. Along with a bed of pasta that was al dente, the buttery cream sauce had a salted egg yolk flavour to it that was so on point! They made the dish asian-style by adding in the curry leaves and chilli – which I think was smart. Typically, a creamy dish would make you feel jelak after a while, but it wasn’t a problem with this dish, and I think that it can be attributed to the appetising curry leaves and chilli. A thumbs up from me! For the rice dish, we went with the Beef Rib Eye Rice (RM39), that brought out some Teppanyaki feels. 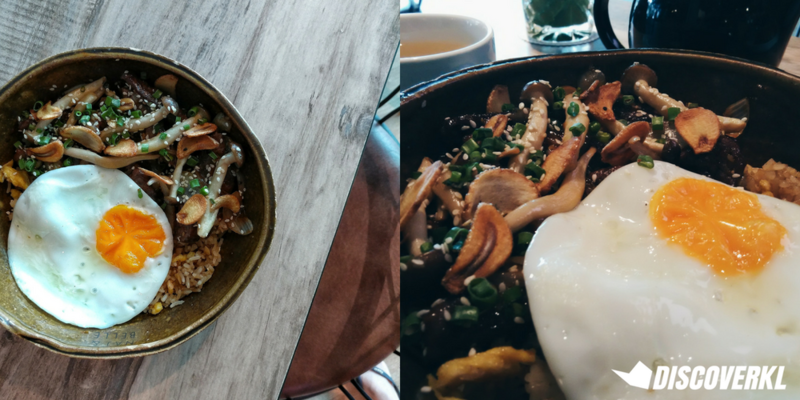 It’s a garlic fried rice, sliced rib eye with sticky chilli sauce, shimeji mushroom, chilli padi and a sunny side up egg. Overall, the dish was okay at best. In my opinion, the chunks of beef was a little inconsistent as some were tender whereas some where sliced bigger and were chewier. You could taste a hint of pepper that did bring the flavours out. However, besides that, the dish was missing a crunch element to it because the fried garlic was a little soggy. I probably wouldn’t order this again, and the dish is over-priced for what I wound up receiving. Moving on to the dessert section of the meal, we had the Rose Lychee & Strawberry Almond Crumble Cake (RM17). It’s a rose and almond roll cake filled with cream and blueberry jam, topped with buttery crumbs. The crumbs added much-needed texture to an otherwise soft, mushy dessert. The rose gelée added freshness to the dish and the lychee was a pleasant surprise that we welcomed. Overall, it’s a light, fruity dessert that is not too much after a heavy meal. 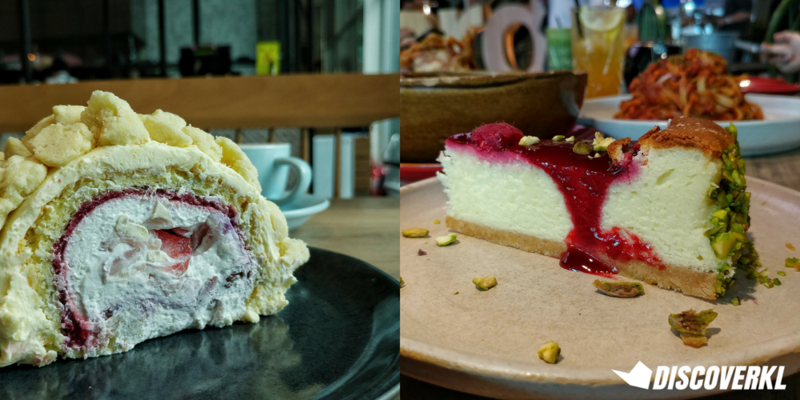 What was lacking was their Pistachio Raspberry Cheesecake (RM17). It apparently was too dense and there was no contrast between the base layer of biscuit crumble and the cake itself. A cheesecake is supposed to be light and fluffy but to me, it just felt like it was made with no love, hence the resulting dish. The pistachio wasn’t crunchy either and the berry cream tasted like an overly-sweet jam spread. Wouldn’t come back for this one, unless they decide to up their game. 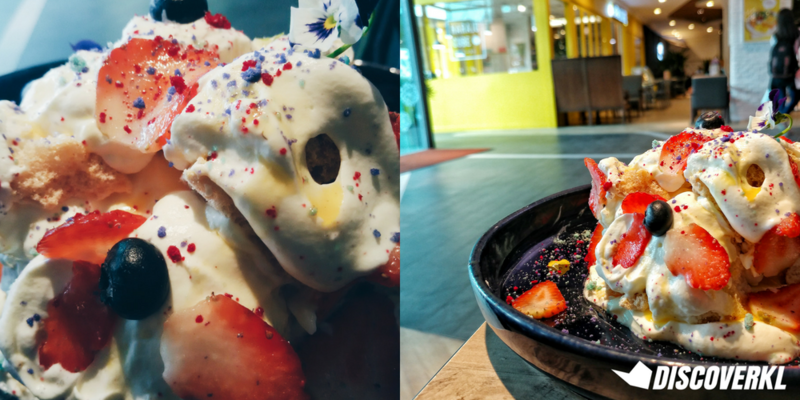 Last but not least, we were saving the best for the last – the Deconstructed Pavlova (RM24). Once it arrived, it looked like a beautiful galaxy on a black platter – it looked too pretty to eat! The pavlova had that perfect light, and airy texture proving that the egg whites were beaten to perfection. The berries also added a much-needed tangy flavour to the dish, as it balanced out the sweetness of the cream. A burst of flavours in your mouth that would actually make you crave for more! It was my first time trying out a pavlova and even if it was a deconstructed one, I was more than satisfied.